We were pleased once again to host the Waco Tribe of the YMCA's Guide Program. The Y Princess program is for 6-9 year-old girls and the Y Trail Blazers, for those in Grade 4 and older. The Y programs focus on strengthening the father-child relationship through activities that allow fathers to spend quality one-on-one time with their children. 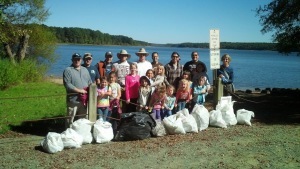 This year's event was led by Eleanor Herr, Director of Jordan Lake Environment Education (JLEE), who is also a long-standing volunteer with Clean Jordan Lake. Matt Valentine, Chief of the Trail Blazers said that"the girls were thrilled to discover the JLEE Center just a couple miles down the road from our neighborhood, and find out about the services that it offers. Eleanor was a wonderful host to our group, providing the introduction to the girls about why it is important to remove trash from our natural areas." We all know that educating our youth about protecting our environment gives us hope for the future. As Matt said "When the girls saw the entire line of full trash bags they had collected, it made a big impression on them. The Dads have noticed our girls wanting to pick up random litter in other areas." These young girls added their own impressions of trash-- "How could someone break this much glass in such a small place?" "All this fishing line could hurt a lot of birds." "I found yucky old boxer shorts. Gross!"